Over the course of this blog, I have eaten a lot of bread. I mean a lot of bread. And this from someone who has insisted for years that it isn’t dinner if there isn’t bread. I’m not saying that this is a bad thing exactly; but I don’t necessarily feel like eating white bread all the time. I not only try to, but enjoy eating as healthily as I can, which for me includes plenty of whole grains (one of my favorite foods is plain brown rice). So in light of the glut of white breads around my house lately, I’m dedicating this week to whole grain breads. If I had to pick one major issue with whole grain breads, it’s that they’re generally thought of as kind of awful – dry, dense, and (dare I say) cardboardy. But they don’t have to be that way! In fact, for much of human history, nearly all bread was whole grain bread. Refined-flour (white) bread was either not invented yet, or was prohibitively expensive for all but the wealthy. And I could be wrong, but I’m not entirely convinced that humans would develop such an intimate relationship with a food that tasted like a cardboard box. Surely there are ways of making a whole grain bread that can rival the tastiness of a white bread. So this is my challenge for the week: to make truly good whole grain breads. I’m not suggesting that a whole grain bread can produce the same sort of airy crumb as a white bread (why that is exactly, I’ll get into later in the week); but that’s a bit like comparing apples to oranges. I am suggesting – nay, insisting – that you can make whole grain breads that are just as delicious as any white bread, maybe even more flavorful in some cases. The bread for today re-vamps a typically horrible food: the bran muffin. When I think of a bran muffin, I imagine a pretty brown muffin that disintegrates into a mouthful of awful, powdery crumbs the instant you take a bite. But because it’s supposed to be good for you, you choke it down anyway, possibly with some coffee just so you can swallow the mess. It’s a crying shame, too, since bran is almost ridiculously good for you, with plenty of fiber and vitamins from here to next week. And not only that, but bran has quite a good flavor to boot, nutty and rich. Unfortunately, the problem with most bran muffins is actually the bran itself (I’m assuming we’re all using wheat bran here). Unlike, say, a blueberry muffin, you can’t just add bran to a standard muffin base, and have it turn out well. This is because bran can absorb more water than wheat flour. 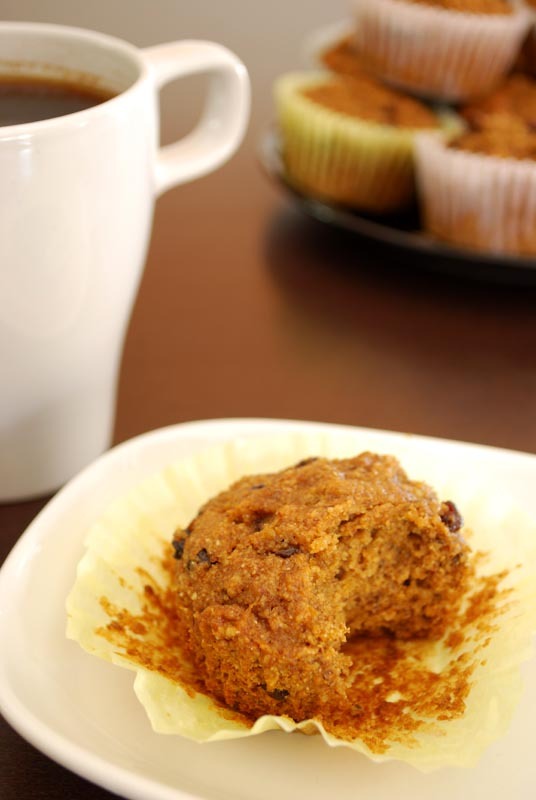 By simply adding bran to a typical muffin batter, all of the liquid is soaked up, leaving the bread dry and ready to crumble at the first hint of a bite. So in order to fix this problem, the recipe here moistens the bran before it’s added to the batter. In addition, there’s a large amount of honey in the batter, which not only tastes delicious, but adds moisture as well as the hygroscopic (moisture-retaining) qualities of sugar. Also boosting the moistness-factor, a healthy handful of currants is added, which absorb moisture from the batter, then slowly release it back into the bread as it sits after baking. Okay, so technically speaking, this recipe should produce a better bran muffin. But does it really? Oh my, yes! A day and a half after baking, they were still just as tender as when I pulled them from the oven. The deep and nutty flavor of bran was absolutely there, but with not a hint of the sawdust that characterizes so many bran muffins. Just sweet enough from the honey (and molasses), but, almost surprisingly, not over-sweet at all. So before you give up completely on this much-maligned and often-abused muffin, give this recipe a try. You might enjoy a cup of coffee along with them, (I did, as you can see) but it’ll be because it’s such a lovely breakfast pairing, not because you’ll need help washing it down! 1. Chop the oats finely in a food processor. Mix with the wheat bran in a large, heatproof bowl. Pour the boiling water over, stir to make a thick paste, and let rest for 15 minutes. Preheat the oven to 375º F. Grease (or line with paper cups) two 12-cup muffin tins. 2. Whisk together the flours, flaxseed, baking soda, salt, and spices. 3. Add the honey, molasses, oil, and sugar to the bran mixture. Whisk in the eggs until thoroughly combined. Stir in the currants. 4. Add the flour mixture and fold together quickly and gently just until the dry ingredients are moistened. The batter will be a bit thick. 5. Divide the batter among the muffin cups. Bake at 375º F for 16 to 18 minutes, or until done (the muffins will feel a bit firm when pressed on top). Let cool in the pan for 2 to 3 minutes. Remove to a rack to cool completely if not serving immediately. 1. If you can’t find white whole wheat flour, you can substitute all-purpose flour instead.